In October of 2015, I took a team of 7 people to trek to Everest Base Camp to raise money for my charity, the Hope for Gus Foundation. The trek raised over $50,000 and exposed us all to a country beautiful beyond words. Nepal was only 6 months out from the devastating earthquake of April of that year, and we almost canceled our trip. In the end, we decided to go because we knew that the country desperately needed what little we could add to their tourist industry and economy after that horrific event. We knew the people were suffering, and we weren’t at all sure what our experience would be like, in light of the recent tragedy. What we experienced was beyond our wildest expectations. The mountains of the Himalayas are breathtaking, unlike anything we had ever seen. But it was the people of Nepal, specifically those in the Everest region, that made all the difference. We flew into the village of Lukla, at the foot of the Himalayas, on a foggy morning. We had to take helicopters, as it was too dangerous to take an airplane. One of our guides, Dev, was with us. He is from the Langtang region of Nepal, north of the Kathmandu Valley. He told us that we would be greeted by our second guide and the porters in Lukla. We were warmly greeted by a young man in a red down coat, with a huge smile and handshakes all around. His name was Adhish and he was from the village of Chheskam in the Solukhumbu District in the Sagarmatha Zone of north-eastern Nepal. Our porters were also from that same region. We later learned that their villages were not accessible by car, and they had walked for several days to be with us on our trek. And so we began, walking for 6 hours that first day. The porters scampered on ahead of us, to deposit our luggage at the tea house, and make sure our rooms were ready when we arrived. Adhish walked in front of us, setting the pace. Unfortunately, the bags for 2 of our team members had been left at the airport in KTM. Dev was on the phone most of the day, trying to figure out how to get their gear to them. When we reached our lodge for the night, in Phakding, he told us that the bags were finally in Lukla, sent out on the last plane of the day. That young man must have run the entire way, as he was back with the bags and a smile by bedtime. We asked how we could compensate him for working 3 times as hard as he had expected to that day. Our guides said, “Our clients are our priority. We are here to take care of you.” The men whose bags he had brought slipped him some rupees anyway. 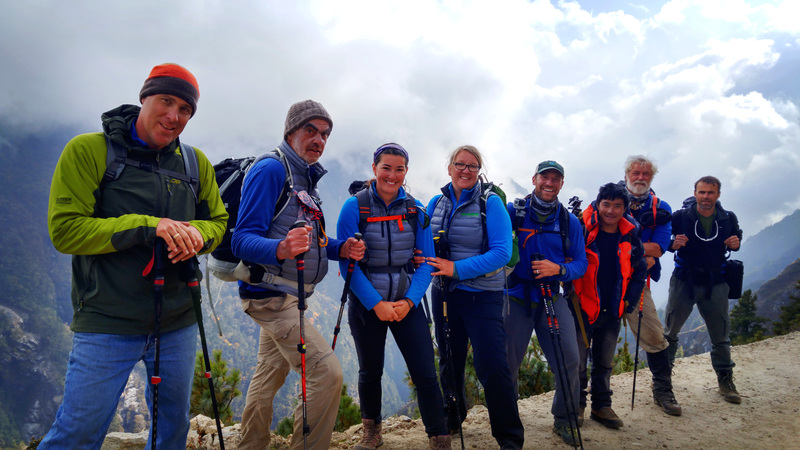 As the days flew by and we got closer to Everest base Camp, I began to notice some things regarding the interactions of the Nepalese on the trail. Dev was very well acquainted with the lodge owners, as he has been guiding for years. But Adhish….it was as if he was a celebrity! Almost every porter or guide we passed called out his name and came over to shake his hand and exchange a few words. When we stopped for the night, he would often slip off to visit a friend who had a shop or a house in the village. Adhish is only 23 years old. So young, from a Western standpoint. But here he was, taking excellent care of a group of unexperienced Americans on the EBC trail, and socializing like the mayor! One morning I discovered that the zipper on my duffle was broken. I had resigned myself to buying a new bag, when Adhish went running out into the village. He was back within a few minutes with some kind of tool and a new zipper and my bag was fixed! I could see now how valuable Adhish was to Dev on these treks. He knew people in every village and could get things done. I later learned that the Kulung are an indigenous people in Nepal, living close to Everest in the Sagarmatha Zone. The Kulung community is one of the most isolated ethnic groups in the country. They live in remote hilly areas, and have very little access to drivable roads, and basic necessities like health services and even clean water. Most of the Kulung are farmers (as is Adhish’s father), but the land is not very amenable to growing food. In recent history, they have had to leave their homes to work in the tourist areas, mostly as porters, carrying back-breaking loads up the mountain. Adhish told me that he started working as a porter at age 14! Many of the make porters we saw were in their 50’s or 60’s and the idea of someone doing this difficult work for decades is unimaginable. They are not all as lucky as Adhish, securing occasional guide jobs. Or perhaps it is not luck, but his charm and industrious nature that has helped him move up in the trekking industry. But even Adhish has limited opportunities. When I asked him what his dream for the future was he said that he wanted to be a full time lead trekking guide – but that it was probably not possible. He said his English is not good enough and he cannot go back to school, as his family could not afford it. I could see that this was the fate of most Kulung men and women working on Everest. They are the backbone of the trekking industry in this region, but their pay is abysmal. However, they cannot move up in the industry without education (first aid and English classes etc…), and they cannot take time away from work because they must provide for their families. One final recent option is for young men and women to go live and work in Malaysia, sending money home. However, conditions are poor there and it can be a dangerous gamble. Communication with their families back in Nepal can be limited, and some never hear from their sons and daughters again after they leave to work in a Malaysian factory. Adhish told me that his older brother was currently in Malaysia, because he has a wife and young children to support. At this point, I had spent 3 weeks with this young man and felt very connected to him. I made him promise me that he would not go to seek work there also. And that he is. Scampering over the trails like a goat, respectfully helping and greeting everyone he meets, and always with a smile on his face and hope for his future. I was fascinated by the stories and the fate of the Kulung people, so I was thrilled when Adhish invited me to come back to Nepal and visit his family in Chheskam. I will return this coming July, so this story is to be continued…….